Born and raised in a small southern college town, there weren’t many places to be exposed to fine art. As a child, comic books and cartoons were Alfred Conteh’s main source of inspiration. His parent’s untiring efforts to educate he and his siblings about history, culture and philosophy, started him down the road to becoming a narrative and sculptural artist. In graduate school, he had the time and facilities to experiment and formulate his own visual voice. The process of “making” became far more personal. His experiences as a man, a southerner, and an African American all found their way into how he expressed himself. It was here that his conviction and confidence as an artist combined to make his work truly important to him. His free-standing sculptures are completely non-objective studies of color, form and texture. His paintings are colorful, yet dark. Some of his works contain subtle discourse on African American culture. Other works have in-your-face text and imagery that is loud and abrasive. Conte uses a variation of symbolism, historical elements, themes and imagery in his representational work. On the other end of the spectrum, he feels compelled to stop “leading the viewer down the road of visual symbolism” and allow rhythm, composition, texture and color to express itself without the intrusion subject matter. In his work, Alfred Conteh struggles to be a non-conformist. The wide and varied nature of the work featured in this show are a clear indication of that fact. 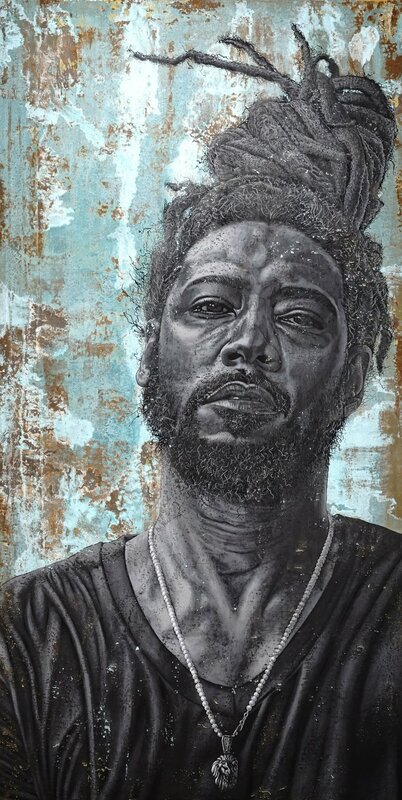 But his representational work is clearly about the portrayal of African Americans in the media, and upon reflection, it’s conceivable that his non-objective work might stem from a desire to escape the burden of trying to deal with such a huge issue within his work.